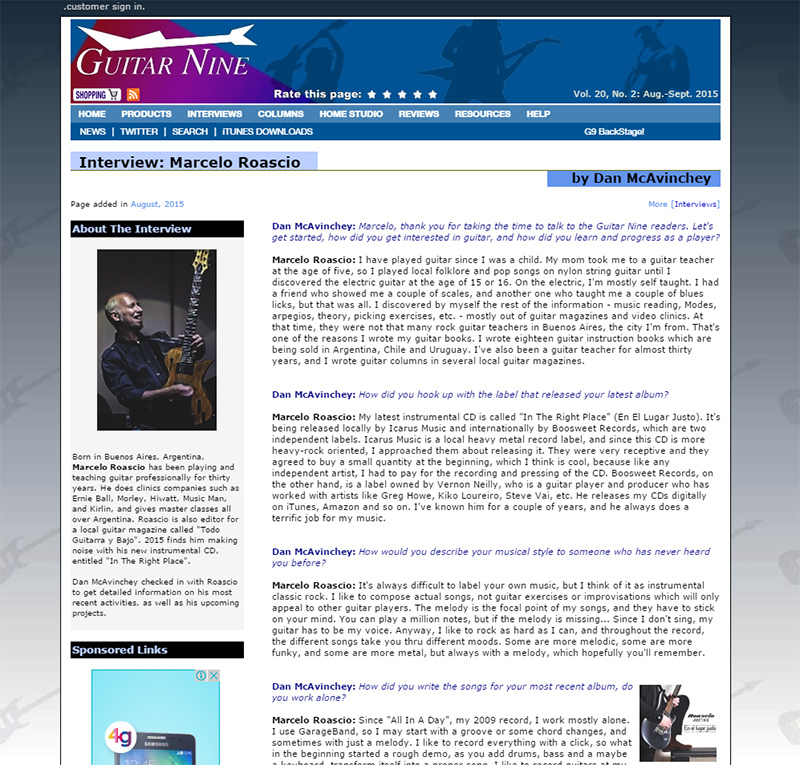 Dan McAvinchey: Marcelo, thank you for taking the time to talk to the Guitar Nine readers. Let's get started, how did you get interested in guitar, and how did you learn and progress as a player? Marcelo Roascio: I have played guitar since I was a child. My mom took me to a guitar teacher at the age of five, so I played local folklore and pop songs on nylon string guitar until I discovered the electric guitar at the age of 15 or 16. On the electric, I'm mostly self taught. I had a friend who showed me a couple of scales, and another one who taught me a couple of blues licks, but that was all. I discovered by myself the rest of the information - music reading, Modes, arpegios, theory, picking exercises, etc. - mostly out of guitar magazines and video clinics. At that time, they were not that many rock guitar teachers in Buenos Aires, the city I'm from. That's one of the reasons I wrote my guitar books. I wrote eighteen guitar instruction books which are being sold in Argentina, Chile and Uruguay. I've also been a guitar teacher for almost thirty years, and I wrote guitar columns in several local guitar magazines. Dan McAvinchey: How did you hook up with the label that released your latest album? Marcelo Roascio: My latest instrumental CD is called "In The Right Place" (En El Lugar Justo). It's being released locally by Icarus Music and internationally by Boosweet Records, which are two independent labels. Icarus Music is a local heavy metal record label, and since this CD is more heavy-rock oriented, I approached them about releasing it. They were very receptive and they agreed to buy a small quantity at the beginning, which I think is cool, because like any independent artist, I had to pay for the recording and pressing of the CD. Boosweet Records, on the other hand, is a label owned by Vernon Neilly, who is a guitar player and producer who has worked with artists like Greg Howe, Kiko Loureiro, Steve Vai, etc. He releases my CDs digitally on iTunes, Amazon and so on. I've known him for a couple of years, and he always does a terrific job for my music. Dan McAvinchey: How would you describe your musical style to someone who has never heard you before? Marcelo Roascio: It's always difficult to label your own music, but I think of it as instrumental classic rock. I like to compose actual songs, not guitar exercises or improvisations which will only appeal to other guitar players. The melody is the focal point of my songs, and they have to stick on your mind. You can play a million notes, but if the melody is missing... Since I don't sing, my guitar has to be my voice. Anyway, I like to rock as hard as I can, and throughout the record, the different songs take you thru different moods. Some are more melodic, some are more funky, and some are more metal, but always with a melody, which hopefully you'll remember. Dan McAvinchey: How did you write the songs for your most recent album, do you work alone? Marcelo Roascio: Since "All In A Day", my 2009 record, I work mostly alone. I use GarageBand, so I may start with a groove or some chord changes, and sometimes with just a melody. I like to record everything with a click, so what in the beginning started a rough demo, as you add drums, bass and a maybe a keyboard, transform itself into a proper song. I like to record guitars at my home studio, whether it be with a miked amp or with some simulation software. Drums and bass are later added in another recording studio. Also, the mixing and mastering is being done at the studio. I work with a recording engineer but I'm my own producer. Marcelo Roascio: I usually play guitars with humbucking pickups. I don't like thinner sounds. For the past couple of years, I've been playing Fernandes Ravelle guitars from Japan with Seymour Duncan or EMG pickups. But starting 2015, I switched for the Ernie Ball/Music Man guitars I proudly endorse. Right now I'm using their Luke III guitar which is awsome, and sometimes the Sterling by Music Man version LK100D, both with DiMarzio Transition pickups. For recording, I may record with some amp simulation software or with a proper tube amp. But for live shows, I always carry my Hiwatt Hi-Gain 50, because it sounds really well in every situation, would it be on a large venue or in a small club. As far as effects, I like to use a Morley Bad Horsie 2 wah, a Carl Martin PlexiTone distortion, and some delay, chorus or compressor by Joyo. I use Ernie Ball strings, Kirlin Cables and leather straps made by a local company called Antitodo. Dan McAvinchey: Are you using any social media sites to promote your recordings and music career? Marcelo Roascio: You have to do social networking as a way to let people know about your work. For example, I recently did a contest on Facebook asking people about which one of my songs should be on a video. Between all of the people who voted, I gave away my new CD with one of my guitar books and a pack of Ernie Ball strings. And it was a hit! The key is to know how to reach out for the right people, the people who may be interested in your music. It's not easy, but as an independent artist, you have to transform yourself into a one man show. For example, I get most of my clinic work out of Facebook. Marcelo Roascio: It's good to hire a PR guy who knows exactly which doors he should knock to promote your music. But here in Argentina, due to our economic situation, this is not always possible for independent artists. Besides having a professional designed website, a consistent YouTube channel, a SoundCloud page and an always renewed Facebook page, I found out that reaching specific websites like Guitar Nine is really good for my music. I don't do Twitter or Instagram, because most of my fan base don't use these social networks either. Dan McAvinchey: What do you now find to be the advantages and disadvantages of being an independent musician? Marcelo Roascio: I've been an independent musician all my life. Record labels take from you a lot more than they give you. If you're independent, you're free to produce the music you want, at the time you want to do it, with the visual art you think is proper for your music, and what's more important, you are the sole owner of your music. Period! The downside is that you have to find ways to finance and distribute your projects correctly. But if you are capable of finding sponsors who believe in yourself as an artist, things get a lot easier. Also, crowdfunding is another way of financing your projects. Dan McAvinchey: Other than guitar-oriented music, what kind of music do you like to listen to? Marcelo Roascio: I like to listen to songs. It could be Stevie Wonder or Slash, Nickelback or Earth, Wind & Fire, Pantera or Toto, Santana or Five Finger Death Punch to name just a few. Regarding guitar players, a million notes can impress you at first, but I like to listen to someone who has something to say. The guitar players who had made a name for themself are the ones who managed to compose songs. I'm sure you remember "Surfing With The Alien", "For The Love Of God", "Black Star", "Led Boots" or "Cliffs Of Dover", right? Dan McAvinchey: Finally, what is on your plate for 2015 and beyond? Marcelo Roascio: "In The Right Place" is just being released, so my main focus is on promoting this new record. I'm also releasing a video for the song "Us Two" which is being aired by a local music TV channel, and Stu Hamm (Satriani, Vai, Gambale) also released a video of the song we played together on the album. I'm doing several radio interviews in which I get to play my songs live, and I'll do whatever it takes to promote the record. As always, I'm doing clinics and shows all over Argentina, and as I did in 2012 and 2014, I will play at the next winter NAMM show for the brands for which I'm an endorser.